On August 15, the Tygarts Valley High School Class of 1964 gathered at the Community Center in Valley Head for their 51st Class Reunion. The class had been invited to Valley Head during their 50th Class Reunion, in 2014, by class member George Coussoule and his wife Sue. On arrival at the Community Center, class members were signed in by fellow classmate Judy (Ware) Primavero. Judy presented each class member with a TVHS Class of 1964 bookmark memento for their 51st Class Reunion. Class members welcomed former classmate Charles Church and his wife Carolyn to their gathering and hope to see them again. The Class of 1964 extends an open invitation to other former classmates at future events. 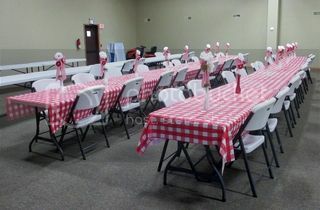 Tables for the reunion were decorated in red and white plaid picnic cloth. Placed on the tables were white vases holding handmade red and white gingham fabric flowers used during the 50th Class Reunion in 2014. 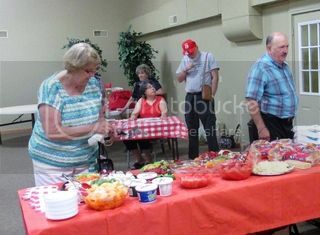 After the lunch blessing by Larry See, the class enjoyed a meal of fried chicken, baked ham, meatballs with sauce, Smokies with sauce, potato and macaroni salads, fruits and vegetables with dips, cherry and peach pies, peanut butter cake and other assorted desserts. The lemonade served on the beverage table became a requested recipe by class members. The recipe comes from the cooking blog Christy Jordan’s Southern Plate at southernplate.com. 1. Combine water and sugar in a medium saucepan over medium high heat and bring just close to a boil. 2. Stir constantly until all sugar is dissolved and mixture is clear. 3. Fill a 2 quart pitcher with cold water to a depth of 2-3 inches. 4. Add lemon juice and sugar water. 6. Add enough water to fill pitcher the remainder of the way. 7. Serve over ice and store any remaining lemonade in the fridge. At the end of the meal the class surprised David Matthew with a birthday cake. David was born on August 15, many years ago. Ralph Hogan led the class in singing “Happy Birthday” to David, their friend and classmate. Some birthday cake went home to be shared with David’s grandson. During a brief class meeting the memorial honoring classmate Randall Arbogast, who died of wounds during the Vietnam War, was discussed. Fred L. Ware, Jr. had spoken with Randall’s sister, Kayleen (Arbogast) Dunsmoor, also a member of the TVHS Class of 1964, who informed him that another death certificate was required for the memorial dedication to proceed. Although a death certificate had already been sent, another copy will be mailed. The class will be kept informed as the effort to honor Randall progresses. Janet (Kittle) McCloud spoke of contacts with class members unable to attend the 2015 reunion who sent their regrets: Sheryl (Hawkins) Birdsinger who was visiting a family member in another area of the state, William “Bill” Doner who has been in the United Kingdom since January, Anna Grace (Casto) Huston who had just arrived in South Carolina from a trip across country and Faye Ellen (Smith) Watson who had to cancel her plans at the last minute. Classmate Gary Channell gave the Class of 1964 treasurer’s report. He informed the class that all outstanding bills will be paid, and that the class remains solvent for another year. At the end of the meeting class members David Matthew and Richard Judy agreed to secure a location for the Class of 1964’s 2016 reunion gathering. Information will be mailed to class members in early 2016 informing them of the reunion plans for the third weekend in August of 2016. Before departing, the class played several games of Bingo. Many nice gifts were won by some lucky Bingo players. The top Bingo winners of the afternoon were Allen and Sharon (Shreve) Armstrong with four bingo wins between them. They took home an insulated food keeper contributed by Danny and Janet (Kittle) McCloud and a Christmas Nativity which was hand painted and restored by classmate Larry See. Their wins also included a book, The Bathroom Reader, contributed by George and Sue Coussoule and a ceramic angel. An engraved Class of 1964 mug, contributed by Beverly (Currence) Hammonds, was also won by the couple. Other multiple winners were Mary (Shiflett) Wamsley and Sharon Matthew, wife of David. Mary won a stand-on-its-own handmade gingerbread doll and a t-shirt contributed by Larry and Sally See. The t-shirt was imprinted with the phrase “I was born in the USA….Many years ago”. Sharon won a handmade autumn wreath and a basket of books containing reading snacks and a book light. Virginia (Shoulders) Hogan, another multiple Bingo winner, took home a spring basket with matching green, yellow and white crocheted afghan. She also won a bottle of fine wine and a handmade fabric Christmas wreath with attached snowman that had been donated back to the game by Tom Zirkle. Judy (Ware) Primavero won some homemade jellies - blackberry, black raspberry and red raspberry - from the kitchen of David Matthew. Tabu cologne was also a Bingo win for Judy. An interesting Bingo win for Dairel Arbogast was an envelope of lottery tickets. Danny McCloud’s win was a Second Amendment sign, contributed by Larry See, which will hang in the McCloud cabin on Kittle Creek. Sally See, wife of Larry, won a ceramic fragrance warmer with vanilla cookie crunch scent. Janet (Kittle) McCloud took home a West Virginia quarter paperweight and two potholders contributed by Judy (Ware) Primavero. Calling the Bingo games was George Coussoule. George was assisted by Fred L. Ware, Jr. who selected gifts for the games and delivered them to the winning Bingo players. Sue Coussoule distributed the Bingo playing cards and markers. The Tygarts Valley High School Class of 1964 enjoyed their time together in the upper valley and appreciated their invitation to meet at the Valley Head Community Center. The Class of 1964’s 51st Class Reunion ended with classmates wishing one another well in the coming year and looking forward to meeting again on Saturday, August 20, 2016. Attending the TVHS Class of 1964’s 51st Class Reunion were: Dairel Arbogast, Gary and Carolyn (Corley) Channell, George and Sue Coussoule, Beverly (Currence) Hammonds, Jerry Haddix, Ralph and Virginia “Boots” (Shoulders) Hogan, Richard Judy, David and Sharon Matthew, Danny and Janet (Kittle) McCloud, Larry and Sally See, Charles and Mary (Shiflett) Wamsley, Allen and Sharon (Shreve) Armstrong, Bob and Edna Mae (Stalnaker) Tacy, Fred and Patricia (McCauley) Ware, Judy (Ware) Primavero, Tom Zirkle and Charles and Carolyn Church. Very good Pat.. another great time for the class of 1964 hope to see everyone again next August and hope even more will be able to attend!! !